Picture courtesy of Jim Chapman. From The Hartlib Papers. A letter from John Beale to Samuel Hartlib dated 9 April 1658, courtesy of Sheffield University Library. In some hundreds of places of this small County, wee have now tried it That the harshest & unpleasant peares, or wilde apples make the richest & most winous liquor. Without hyperbole, I assure you, as being in sport & for further testimones oft-times an eye witnesse to it, That our hungry swine will not bite these peares, & most especially the bareland peare of Bosbury which makes a liquor That in common houses & with little or no care increaseth strength & excellency for 3 yeares together, & in the second yeare takes a deepe fulvous color, & hath a pungent stroke on the tongue as I have found in well-commended Greeke Wines. Yet this pearmaine Cider which this Gentleman hath newly offered carryes the wonder. Now the plaine truth is that this applauded pearmaine Cider is a designed equivocation it being only made of peares kindly mingled with Common Crabs a liquor soe cheape & vulgar that this gentleman hath at this time many Tunns of itt, All his common hedges yielding store of it. He sayth that, to bring the Bosbury rough peare to heighten & strengthen this kind of pleasing Cider, he letts them fall of the tree in their owne time of Ripenesse & there lye a while on the ground where they fell, not stirring them till, to avoid rottennesse, they must be ground in the mill. Most other Kinds of Perry are of a more waterish Colour, than Apple-Cyder, and more luscious. The white Horse-Pear yields a Juice somewhat near to the Quality of Cyder; and the Neighbourhood of Bosbury is famous for a peculiar Perry, which hath many of the masculine Qualities of Cyder. It is quick, strong and heady, high-coloured, and retaineth a good Vigour two or three Summers; yea, in great Vesssels and good cellars many Years, before it declineth. The Fruit is so hard and coarse, that a Man cannot endure to bite a Morsel of it, and a Pig will refrain it. This Bosbury Pear is there called the Bareland Pear; and as the Liquor approacheth to Apple-Cyder in Colour, Strength, and excelleth in Durance; so the Bloom cometh forth of a damask Rose Colour, like Apples, not like other Pears. 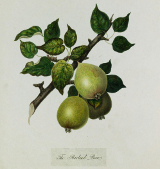 Section VIII - Perry Pears. Page 414. 157. BARLAND. Pom.Herefordiensis, t. 27. Fruit rather small, of an oval figure, but broadest towards the crown. Eye prominent, and the segments of the calyx nearly erect. Stalk half an inch long. slender. Skin dull green, russetted with a muddy grey. Specific gravity of its juice 1070. 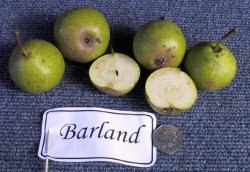 The Barland Pear appears to have been extensively cultivated prior to the publication of Evelyns Pomona in 1674, and many thousand hogsheads of its perry are yet made annually in Herefordshire and the adjoining counties, in a productive season. It may be mixed in considerable quantity with new port without its taste becoming perceptible. It sells well whilst new to the merchants, and as it is comparatively cheap, it probably forms one of the ingredients employed in the adulteration of this wine. 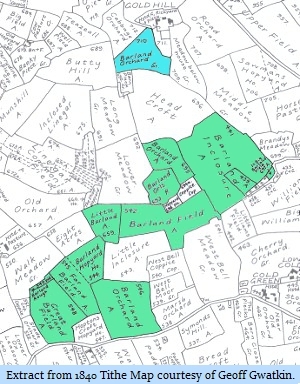 The original tree grew in a field called the Bare Lands, in the parish of Bosbury, in Herefordshire, whence the variety obtained its name, and was blown down a few years previous to 1811. Until 17th century perry was made from all varieties of pear, both wild and cultivated, but quality was not outstanding. The monks of Worcester continued to import pipes of wine to supplement the perry they produced from wyld peres and grete tame peres. This was to change, John Evelyn’s Pomona (1664) records that growers around May Hill (on the Gloucestershire/Herefordshire border) were then beginning to select the feral pears which produced the best perry. It is from these selections that the varieties known today are descended and are the source of true perry that in the 18th century attained a quality which came to supplant wine - a quality craft producers are today once again seeking to achieve. Juice from culinary and dessert pears produces a pleasant, but less complex drink - one that should not really bear the name perry, pear cider is perhaps a better description.